Great team work! This idea was generated during our Legislative Leadership Initiative, a think tank comprised of local citizens brainstorming and doing research on how to improve our community in District 104. Working together we can make a difference! 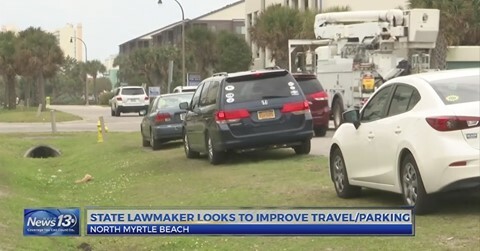 NORTH MYRTLE BEACH, SC (WBTW) – State Representative Greg Duckworth has a plan to improve transportation and parking in North Myrtle Beach. He unveiled his ideas last week to different local leaders. Duckworth wants to change Ocean Boulevard with the help of only a paint can– he doesn’t want to do any kind of construction there but rather wants to rework some of the traffic lines. His plan calls to cut down the width of the North and Sound Bound lanes and add two bike lanes on both sides. On certain parts of the South Bound lane, he wants to add on-street parking. To do that, the plan says to get rid of the center turn lane and instead use that space to veer the South Bound lane around the new street parking. Under his plan, you could even see water taxis come to the city. “Entice more people to think about different ways to get from point A to point B,” Duckworth said. These ideas are all very new, and ones Duckworth said he hopes to worth with the city of North Myrtle Beach on in the coming months.